Paintings of armed angels were popular in and around Cuzco and La Paz in the Viceroyalty of Perú, and were created in large sets. Originally, their iconography was inspired by European printed sources of angels, and of military exercises. As is this image, most examples depict angels dressed head to toe in elaborate but worldly clothing. At the top left of the painting, the inscription reads “Asiel, Timor Dei,” or Asiel, Fear of God. Typically, such paintings name these armed angels. In one of the apocryphal books of the Bible, angels control the course of the stars and planets. Because of this, art historian Teresa Gisbert attributes the popularity of armed angels in the Andes to Church attempts to replace native Andean practices of star worship with that of Christian angel worship. 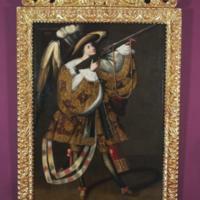 This particular angel is garbed in elaborate 17th-century clothing. Armed angels from other series wear Roman military costume. Similar outfits were sometimes worn during festival processions, particularly by indigenous people. While this is not an original frames, gilded frames like this one were typical in 17th and 18th century churches in the Andean highlands. They were often more valued, and expensive to produce, than the paintings they framed. This image measures 160.5 x 110 cm (ca. 63 x 43.5 inches), and was created of oil paint on canvas. Images of angels bearing arms still exist in situ in churches, as in Calamarca, Bolivia. 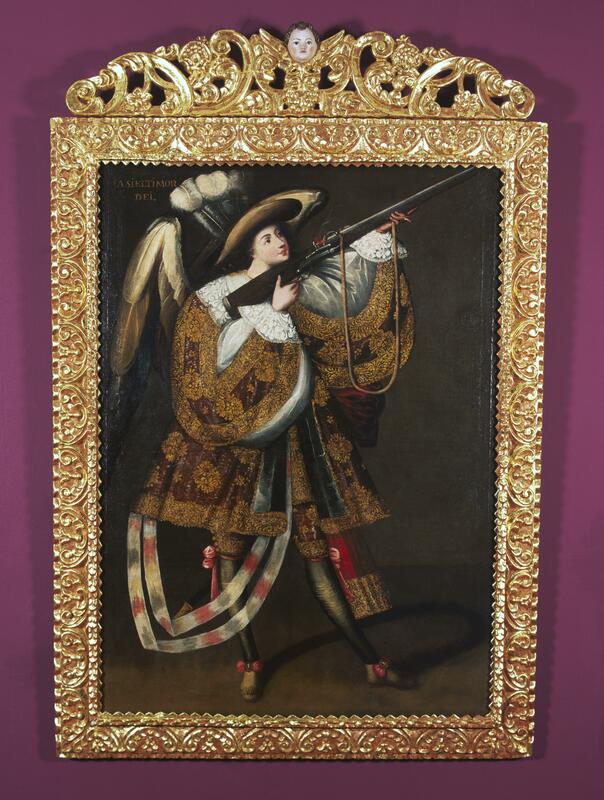 But one 18th c. depiction of the interior of an elite home shows such armed angels on the walls, so they may have also been hung in private homes. Images of armed angels, like this one, come from a particular region of Spanish America—the areas surrounding La Paz and Lake Titicaca, and, secondarily, Cuzco. Created primarily for local churches, these paintings were not traded widely across Spanish America. While many artisans and workshops, from Chile to Cuba, also drew upon European prints as sources, these paintings suggest how regional tastes and distinctions shaped the production of local visual cultures. Acalá, Luisa Elena. 1999. “Asiel Timor Dei, arcángel arcabucero.” In Los siglos de oro en los virreinatos de América: 1550-1700. Pp. 351-354. Madrid: Sociedad Estatal para la Conmemoracion de los Centenarios de Felipe II y Carlos V.
Gisbert, Teresa. 1999. El paraíso de los pájaros parlantes: la imagen del otro en la cultura andina. La Paz: Plural Editores. Gisbert, Teresa. 2006. “Asiel Timor Dei.” In The Arts in Latin America, 1492-1820. J. J. Rishel with S. Stratton-Pruitt, eds. Pp. 422. Philadelphia: Philadelphia Museum of Art, and New Haven and London: Yale University Press.